The Most Targeted, Cost Efficient And Effective Type Of Online Advertising Available TodayAnd Exactly How To Use It! Choice 1: You can advertise your website by placing ads in news papers, magazines, bus stations and other places where people may see your ads and hope that a few of these people are actually interested in what your website has to offer. Choice 2: You can try to place banner ads on websites that relate to your own, post links to your website in link-directories and discussion forums and hope that people see your ads/links and click on them. Choice 3: You can choose to advertise only to those people who are actually searching for what you can offer them, and have your ad show up only when these people are in the process of searching. Oh, and you would only have to pay when one of these interested people actually clicks on your ad and visits your website! Ok, ready? If you chose #3 you have chosen to use PPC advertising with Google Adwords: you have made the right choice! So, what exactly is PPC advertising? Imagine Taking Out An Ad In A Magazine And Only Having To Pay A Few Cents Every Time One Of The Readers Actually Visits Your Store! Create a short ad (no graphics or fancy banners, just a few words that best describe your business). After you create your ad, you will need to choose some key words that best relate to what you are offering. So if you are selling a self defense guide your main key words would be something like self defense, defend yourself and so on. After you have your key words you will need to set your maximum key word bid (how much you are willing to pay for every click) and your daily budget (how much you are willing to spend on advertising every day). Your Ad Will Be Shown Only To People Who Are Searching For What You Are Offering, And You Will Be Charged Only When These People Actually Click On Your Ad And Visit Your Website! But before you do, you must know exactly how to use Google Adwords and PPC advertising to its maximum potential or this revolutionary way of advertising can turn into a time consuming and frustrating money pit. Choosing the right key words, writing attention grabbing ads and learning to make your campaigns as cost efficient as you possibly can are just a few of the things you must learn if you want to take full advantage of PPC advertising. And thats exactly why the Google Adwords Primer was created! What you need to know about setting up your first Adwords campaign and exactly how its structured PLUS tips on how to manage your Adwords account and campaigns. How to find cheap but targeted key words to bid on if you plan to inter a hot market like weight loss or discount travel you can end up spending a fortune on PPC advertising by bidding on key words that cost as much as $5, $10 or even $20 dollars per click! Exactly How to write powerful Adwords ads that attract peoples attention! To put it in simple words: you will learn absolutely everything you need to know about successfully using Google Adwords to drive highly targeted traffic to your website ... and more sales in your shopping cart! And best of all, youll get it all explained to you step-by-step in a simple to read and easy to understand guide. Remember, this guide will teach you everything there is to know about using the most targeted and cost effective type of advertising available today. And will save you countless amounts of time, money and frustration you would have to go through if you tried to figure out Google Adwords all by yourself through the trial and error process. Yup, thats right! You can learn absolutely everything you need to know about using Google Adwords to take your online business to the next level for only $3.75. 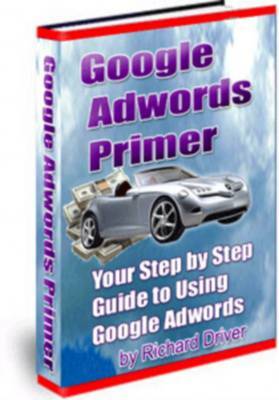 GUARANTEE: Get the "Google Adwords Primer" guide right now and read it over. Try the information out. If you are for any reason at all not 100 satisfied, send me an email within 60 days after purchasing, and I will personally refund every penny of your money, no questions asked. It's as simple as that. You have absolutely nothing to lose. With the above guarantee, the risk is 100 on me. So why not give it a try right now? Bonus: And if you order right now, I will give you Master Resell Rights to Google Adwords Primer and a copy of this sales page(s), so you can resell it and keep 100 of the money. PS: The sooner you order the Google Adwords Primer the sooner you can start pumping your website full of laser targeted traffic thats made up of people who are actually searching for what you have to offer! PPS: Imagine how much easier it would be to sell bottled water to a bunch of thirsty, hot explorers that are searching for water in the middle of the Sahara desert ;) Believe it or not, this theory can be applied to your very own website with the help of Google Adwords and Google Adwords Primer!